Brrr! It's still cold out there. We fared better than some yesterday. The wind took out power in part of our town and the next one over, and the town was preparing to put folks up in the high school. We were fortunate to keep our power. But there was a tragic death because of the wind. Deep breath of gratitude and sorrow. Last night as I was drifting off to sleep, I was thinking about quilts. We were under the one my grandmother made for our wedding, and I was thinking of the ones I've made. And the thoughts drifted to wondering if I could combine the quilting with the sewing I do on recycled sweaters - maybe on jackets or skirts or bags...? I'll have some fun playing with that idea. Gordon Bok sings a song of a woodcarver, and some of the lines are beautiful to me right now: "While my hands are steady, while my eyes are good, I will carve the music of the wind into the wood." Somehow that resonates with me about the birds I sculpt. And especially with the injury to my arm, I'm not sure if my felting days are numbered. They are certainly limited. I felted too much yesterday and will have to rest the arm today. So I think I value the felting I can do more. So anyway, here's more of what I've worked on this last week/month. 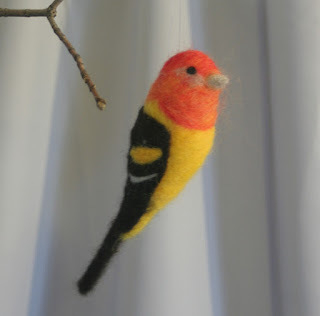 This is a western tanager. I don't ever see this bird, but his picture is near the goldfinch in my bird book, and he's so beautiful, I just have to have him around sometimes. This is a red breasted nuthatch. I've never seen one, but they are native to my area, so I hope to someday. I have the white breasted ones at my feeder every day. Thank you for sharing this! I just received alpaca rovings from my cousin in TX. I now know what my project is going to be thanks to you! Lovely birds. 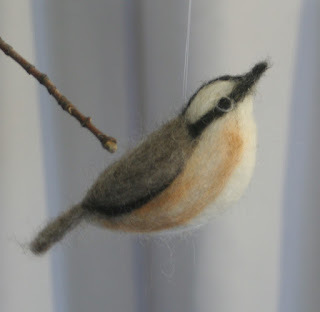 I too do needle felting and it is so soothing to sit and create something from nothing. We have the Western Tanagers at our place every year. The book doesn't do them justice. They are absolutely stunning! One of my favorites.